A newly-discovered trove of Aztec sacrifices could lead archaeologists to the most tantalising find yet: an Aztec emperor’s tomb. The sacrifices were discovered in downtown Mexico City, near the steps of the Aztec’s holiest temple during the reign of the empire’s most powerful ruler. The sacrificial offerings include a richly adorned jaguar dressed as a warrior, and a set of flint knives elaborately decorated with precious stones. The offerings were deposited by Aztec priests over five centuries ago in a circular platform in front of the temple where historical accounts describe the final resting place of Aztec kings. Such a discovery would mark a first, since no Aztec royal burial has yet been found despite decades of digging. The jaguar offering, found in a large rectangular stone box in what would have been the centre of the circular platform, has stirred particular excitement. Only about one-tenth of the box’s contents has been excavated, but already a wide array of artefacts has been found near the top, including a spear thrower and a carved wooden disk. 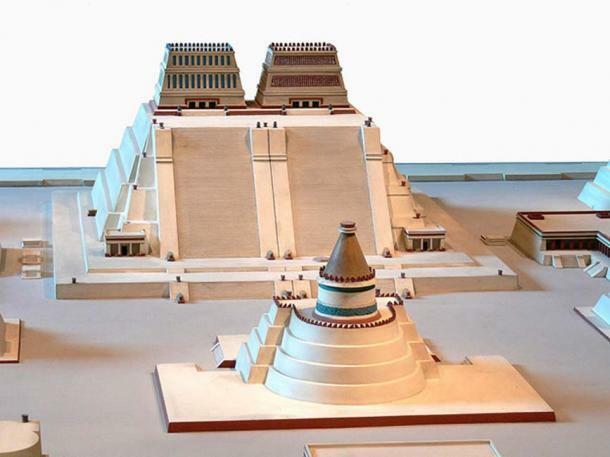 Expanded by each Aztec king, the shrine was believed to be at the centre of the universe and was crowned with two smaller temples, one on the north side dedicated to the rain god Tlaloc and one on the south to Huitzilopochtil. Mexico’s new government has cut the project’s budget by 20 per cent this year, according to several archaeologists who work on the excavation, and nearly all members of the 25-person team have not been paid since December.